When catastrophe strikes we can always count on photographers to offer up images of citizens helping their fellows in times of need. These images usually focus on the drama of rescue amid dangerous circumstances. Firefighters work to save property and lives, police officers maintain order on behalf of the helpless, and EMTS rush to aid the sick and the injured. The camera follows dutifully, recording their efforts for a public concerned, curious, or otherwise compelled to look. What’s a disaster good for if it doesn’t bring out the best in our best? But what of those smaller, one might even say trivial acts of assistance of the sort depicted in this picture? This photo represents the community that emerges from the mundane aftermath of tragedy. An anonymous commuter dealing with the disruption caused by the June 22 Metro accident struggles to board a train. A rider, already on board, holds the door so that another might enter—a telling courtesy given that our usual stance on public transportation is one of unenlightened self-interest. In holding the door this woman—the hand looks female though the figure is invisible behind the equally anonymous office-casual male in the foreground—gives up a bit of her comfort for a stranger she recognizes as a resident of a community brought together by the inconveniences that follow inevitably from catastrophe. It translates the bodily pains and horrors we extrapolate from the collision photos into the harmless bisection here. We feel guilty when angered by the minor inconveniences of catastrophe. The profound suffering of the catastrophe’s immediate victims makes our frustration with a missed appointment seem the height of selfishness. The paper held by the same hand holding the door reminds us to feel this guilt, to forfeit self-pity and our personal comfort to make room for empathy. This picture shows us that these minor inconveniences provide the opportunity to recognize our membership in a public in trivial acts, and in the comings and goings of civic life. 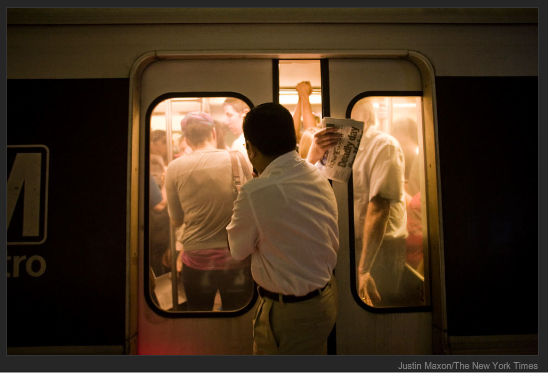 We rarely think of ourselves as part of a community when riding public transit. We react to the limited personal space by retreating into our audio players, cell phones, newspapers, ourselves. The minor inconvenience to which the door-holder exposes herself echoes the small claim on our time that disaster coverage makes, our compulsion to read the paper—a compulsion the door holder shares. Her discomfort echoes moreover the discomfort we feel when we take the time to look at images of disaster. This discomfort, in turn, functions as a visceral reminder of our membership in a community. Reading the paper, looking at photos, it’s the least we can do. Photograph by Justin Maxon/New York Times. Nathan Atkinson is a Ph.D. candidate in rhetoric at Carnegie Mellon University. He is currently completing a dissertation on the visual rhetoric of atomic testing at the beginning of the Cold War. Nate can be contacted at natkisno@andrew.cmu.edu. This guy is actually comitting a major faux pas. The doors on the WMATA trains are not designed to act like elevator doors; if one is blocked, the whole train can shut down. More crassly: this guy is being a major douche and should probably know better. It’s funny while I am reading this, I am retrieved into my newly bought Macbook.